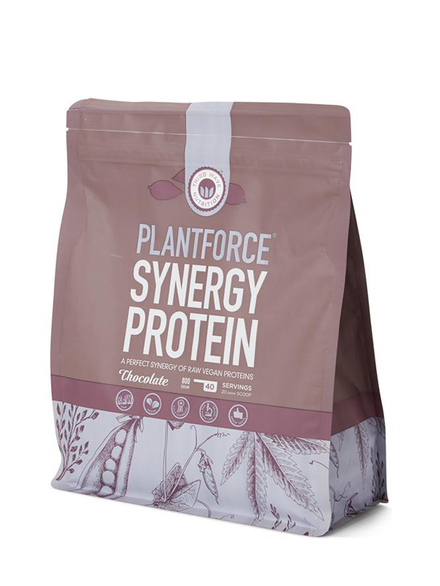 Synergy Protein Chocolate 400g (PlantForce) - HealthySupplies.co.uk. Buy Online. Plant protein powder with cacao. Pure mix of rice protein, pea protein & hemp protein. High in BCAA (branch brain amino acids). Ideal for smoothies & protein shakes. Delicious chocolate protein blend suitable for mixing into a variety of drinks and recipes. A simple way to add more protein and fibre to your daily diet. Add to raw food recipes such as snack balls, no-cook flapjacks or cookies. Brown rice protein, pea protein, organic hemp protein, organic fat reduced cacao powder, thickener (xanthan gum), natural flavour, sweetener (steviol glycosides). Wheat-free • Vegetarian, Vegan • Fairtrade.